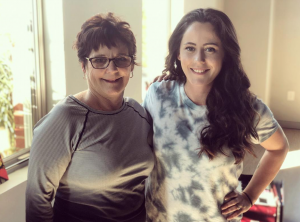 Apparently, the crazy apple may not fall too far from the tree, when it comes to Teen Mom 2 stars, Jenelle Evans and her mother Barbara Evans. On Saturday, January 19th, the mother and daughter appeared on Instagram Live with castmate Brittany DeJesus. Things went completely left when Barbara brought up Kailyn Lowry. While drinking wine, she states “We should all get lit and we’ll go kill Kail.” Wow!!!! First off, I need her to never say “lit” again. Second, whose mother/grandmother makes jokes about killing someone? I highly doubt she really has the desire or capacity to kill anyone, but this was just weird. Barbara has since responded. She insists that she was attempting to be sarcastic and making a joke. But Kailyn is clearly not amused. She has tweeted a few times in response. Meanwhile, some fans have speculated that Barbara may have been a little inebriated when she made those comments. Jenelle has also responded to the drama to defend her mom. She has told fans that it’s not that serious and they are not going to harm anyone. I don’t think anyone would truly believe Barbara is going to harm Kailyn. Even so, the joke or whatever you want to call it shouldn’t have been said. Given the past between Kailyn and Jenelle, she isn’t going to take anything from this dysfunctional family kindly. TELL US –WHAT DO YOU THINK ABOUT BARBARA’S COMMENTS ON INSTAGRAM LIVE? DO YOU BELIEVE KAILYN SHOULD BE UPSET?